During an airfare promo from AirAsia a few months back, we frantically booked seats to wherever the promo applied. When the dust settled, we were able to book multiple flights to 7 countries, all Asian countries, except one, the Land Down Under, Australia. We were thrilled, but in the back of our minds, we were wary of the Visa application process, but armed with Visas from South Korea and Japan, both OECD countries like Australia, we were much more confident of the application process. Good news to us Filipinos, the Philippines is now one of the chosen countries who can apply for an Australian Visa online through the official website of the Department of Immigration and Border Protection (DIBP). For the past years, Filipinos had to apply for an Australian Visa through a third-party service provider, VFS Global. Filipinos can still apply through them though however, there will be an additional service fee on top of the visa fee plus you are obliged to pay the courier fees for document collection and return. The advantage of applying online aside from it’s cheaper and more convenient, is that you do not have to submit your passport to the embassy which means, you can still travel abroad while waiting for your visa approval. The biggest disadvantage of the online application? You’re only sent an email that serves as the e-Visa and you’re not going to have some fancy copy of the Visa on your passport that you can brag to your friends. We know, it’s really disheartening. Read on as we will be sharing tips, guide and visa requirements based on our experience in applying for an Australian Tourist Visa. If you are looking for other requirements depending on your status, you can directly visit their official website. Helpful tip 1: If you think that above requirements are not enough then you can add more documents. Anyhow, you can attach files up to 60 per applicant. Helpful tip 2: We’re not sure as to what the minimum amount you should have on your Bank Certificate because the Embassy of Australia nor any of the travel agencies never disclosed this information. Just make sure your bank account is opened for at least 6 months from the date you applied for a visa. Helpful tip 3: If you are applying with your baby, attach all your documents to your baby’s application. Helpful tip 4: In case you want to submit a cover letter, whatever reasons you indicate in your letter, make sure you submit proofs/documents as backup. Like for example, in our case, we mentioned on our cover letter that the reason why we should be going back to Philippines is to attend Sheena’s mother’s 1st death anniversary. As backup to this, we scanned a copy of her mother’s death certificate and attached it our applications. ImmiAccount is the DIBP’s front door to their online services. You need to use ImmiAccount if you want to apply for a visa and a lot more. Once you have registered an ImmiAccount and login, you can now start creating a new application. Make sure you choose Visitor Visa (600) for tourist visa. The application form is pretty much straightforward. You can save it and log back in to finish the application. Once you are done filling out the online application form, you will be routed to a page that lists all major documents required. You are given 1 month to complete the documents. You will receive an IMMI Acknowledgement of Application Received email. How to check the progress of my visa application? You can check the progress of your online application through your ImmiAccount. 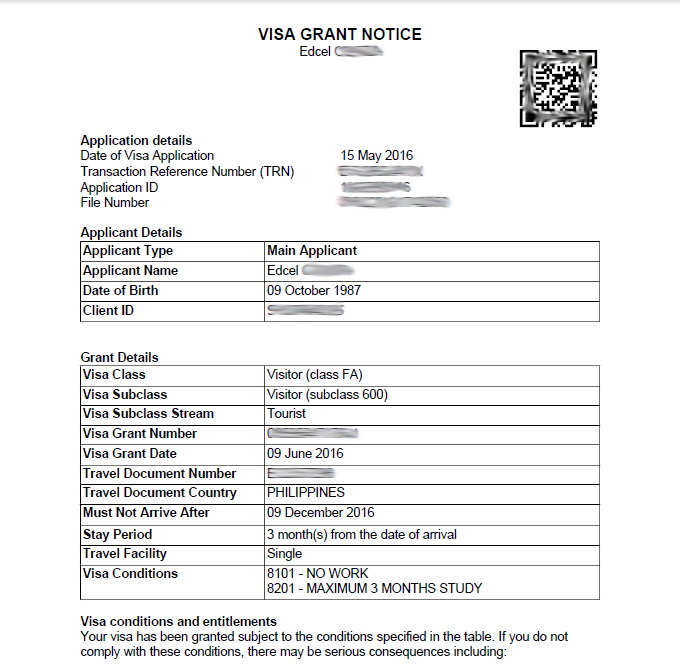 For subclass 600 Vistor Visa, the fee is AUD 135 plus a minimal surcharge for card payment used. The online application only accepts Visa, Mastercard, American Express, JCB, and Diners Club International. How long will it take to process the Visitor Visa? Normally, it takes 3-4 weeks but there are some who experienced longer than 4 weeks. That is why, it is advisable to submit the application 3 months before your intended departure date. Do we have to submit our plane ticket and accommodation? No. It is not required. Just wanted to ask for your assistance since I’ll be applying a visa along with my baby, when you said “Helpful tip 3: If you are applying with your baby, attach all your documents to your baby’s application.” What exactly do you mean by this? I have initially created my online application for my son and some of the docs needed is travel history which he doesn’t have yet as he was just born last April 2016? Did you provided any affidavit for your baby? Any additional forms? Hi Kayen! I’m just wondering how you got about it. I’m also applying for a visa for my infant. Hi! Would like to thank you for blog. Your tips were definitely helpful in my tourist visa application. Would love to help others the same way you helped me. Does this mean that I have to provide the details of my family not travelling with e? i.e. my parents, brothers and sister? hi Ms. Sheena.. if ever I’ll be a first time traveller so I don’t have enough visa stamps in my passport yet. I’ll be flying to Vietnam this year will that be enough if I will try to apply for a visa in Australia? Good day I am self employed but i dont have proof like itr or whatsoever because im a freelance piano teacher. Is it better to put self employed or unemployed? If this is the case will i be approved of tourist visa if i will indicate that my father would sponsor my trip with his financial docs? Or should i really have an australian contact? I heard that in other blogs its a red flag to say to visit your boyfriend. Yup, im curious too if you submitted notarized scanned documents? Thanks! Cool! We got ours with the help of Jeff at Down Under Visa (www.downundervisa.com.au). Got it first go.